From New York to Florida – The Perfect Road to Pain Management! After practicing in New York for several years, Dr. Lichter and his wife relocated to Tampa in 1994 to take advantage of the warm weather and easier lifestyle. 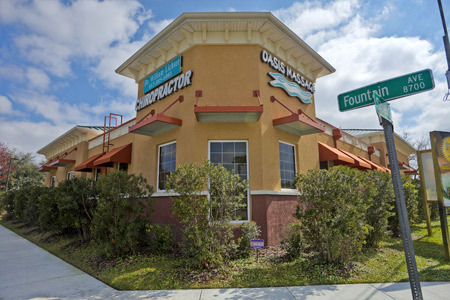 The practice was established in 1995 and has grown to include an associate chiropractor, three massage therapists and, in 2010 was moved into a custom built state-of-the-art facility to better serve the patients. Our ultimate goal is to help you, even if that means referring you to someone else. Whenever possible, though, we use the wide scope of our practice to help promote your overall health. We offer the following services in conjunction with chiropractic. Helping patients and their families lead a pain-free healthy life is the motto of this Tampa chiropractor. We combine modern treatment protocols, devoid of any kind of pressure with old fashioned care! At the end of the day we want you to see results! Your healing begins as soon as you enter our office. Interior designers and a feng shui consultant utilized soothing color schemes and quality materials to help you feel more like you’re in a home than a office. Technology including direct digital x-ray, computerized spinal EMG scan and spinal decompression is combined with the utmost attention from caring doctors and staff. We feel that our office is the culmination of many years of hard work helping thousands of people. Choose Dr. William Lichter as your chiropractor and lead a pain-free life at an affordable fee. Give us a call or stop in and meet our team and make us your partner in the battle against pain today!